With the hot days of summer right around the corner, it’s time to start thinking about getting your central air cpmdotpmomg unit ready to keep your home cool. 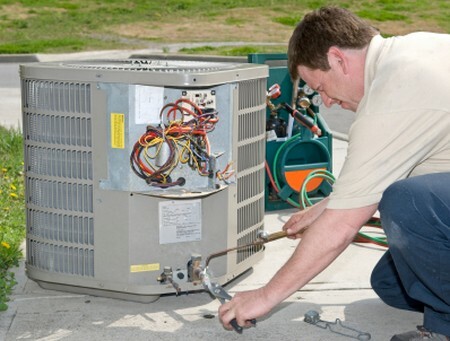 Having a professional come to your home to clean your central air unit can cost you several hundred dollars. But, it’s a crucial step in maintenance that can literally add years to the life of your unit and help it to cool more efficiently. The good news is that you don’t have to hire a professional, you can easily clean the central air unit yourself and save a lot of money. Before you attempt to do any type of maintenance on a central air unit, make sure that you turn off the electricity to the unit. Central air units operate off of 220 volts of electricity which can cause severe injuries and even be fatal. The shut off box is generally located very close to the outdoor unit. Some units have a handle that you pull down to turn off the power. Some have a removable breaker that you’ll need to pull out and some have a fuse that needs to be removed. If your unit doesn’t a shut off box, you’ll need to locate the circuit breaker inside your home and switch it to the off position. Almost everyone knows that you need to change the filters that are in the inside unit regularly. However, many people don’t realize that you should also clean the fins that are located behind the filter. Every time you change the filter you should inspect the fins to see if there’s a build up of dirt and lint. You can use a soft brush to clean them, or use the brush attachment with your vacuum cleaner. It’s also a good idea to clean the blower each season. Remove the blower cover and clean the inside with a soft brush or vacuum cleaner. While you already have access to the blower, you should go ahead and oil the motor. Almost every hardware store carries electric motor oil and it’s fairly inexpensive. You should be able to see several oiling ports on the motor. Oiling ports are simply small holes that take the guess work out of oiling the air conditioning units motor at the proper places. The holes are located exactly where the oil needs to go and all you have to do is to place several drops of oil into each one. To remove the metal covering that protects your outside unit you’ll need to remove several screws. Raise the cover straight up and set it to the side. Remove any dead leaves, grass or other debris that has collected on the condenser. And, use a soft brush to remove any loose debris from the metal fins. The next step is to remove the grille located on the top of the unit. The fan is actually attached to the grille on most models, so you may need help with this step. Be very careful not to pull on any of the wires when you raise the grille up to clean it. Raise it straight up and have someone hold the grille you while you remove all of the debris. You can use a water hose with a spray gun attachment to clean the fins. Place the sprayer on the inside spraying outward. Make sure to remove all the dead grass, insects and debris that you can see. When you place the grille back onto the unit, make sure that you don’t let any of the wires get trapped underneath the edges. Before you replace the unit cover, spray it out with the water hose to remove debris. Lift the cover up and set it straight down on top of the unit and replace all of the screws. If it took you four hours or longer to clean the unit, don’t turn the unit back on immediately. Turn the thermostat off, turn the electricity back on and wait for at least 24 hours before you use the central air. The compressor inside the unit has an internal lubricant that needs to be warm to prevent damage to the unit. When you turn the power back on and let the unit set, the warming element has the time it needs to heat the lubricant. After you’ve waited at least 24 hours, you can adjust the thermostat to the cool setting so the unit will come on. Once you have the unit running, go back outside to the unit and see if you can hear any strange noises. If you do hear noises, you will need to remove the cover to see if anything is hitting the blade, or if something feel inside the unit. If there are noises, but you can’t find a cause, you’ll probably need to have a professional find the problem.